In the true tradition of Hindustani classical music, well-known flutist Vinod Prasanna will be observing the Chilla period of penance and solitude. For 40 days and 13 hours a day beginning January 08, 2015, Prasanna will be confined to his room, practising his flute, live on a special diet and have no interaction with the outside world. “The chilla is performed for spiritual as well as worldly attainments, psychic abilities or complete enlightenment depending on the desire of the practitioner who performs it,” according to experts. For Prasanna, undergoing the Chilla has a special meaning. Besides aiming to achieving high skill in his art, he will also be raising funds to further the cause of his music. Those who wish can go to www.bansuri.com.au and donate. “It will not be an easy task but I am committed and preparing myself for this,” says Prasanna. Prasanna’s journey as a flutist began since the age of 18 performing at the famous temple of Goddess Seetla, in the Hindu Indian town of Varanasi after training for years as a child under the tutelage of his renowned Shahenai player grandfather Pandit Vishnu Prasanna. He belongs to the famous Banaras gharana family which has performed for more than two-and-a-half centuries. Over the years, he has given many international performances in France, Germany and Japan, to name a few, and received many awards along the way. In Australia, Prasanna has performed at the Global Harmony festival in Coffs Harbour, where his music was received well. Together with brilliant Australian tabla player Glen Kniebeiss, he stunned audiences at the Bellingen Global Carnival in 2008. In 2009, he also performed at the Music for Meditation at the Federation Square and at the Fairfield Amphitheatre Summer Concert Series. He was also part of the inaugural celebrations for the 2009 opening of the Parliament of the World’s Religions, performed at the Premier’s 2009 Sustainability Awards and at The Melbourne Arts Centre for the Multicultural Arts Council, Victoria. In 2009, Vinod’s music was also featured on the soundtrack to Australian film The Taj. In 2010, Vinod's music was enjoyed by thousands at the Woodford Folk Festival where he teamed up with Glen Kniebeiss again. It has been said that Prasanna’s sublime flute song takes the listener on deeply moving journeys, both musical and spiritual. Wherever he plays, he captures the hearts of his audiences. Prasanna’s music pays homage to both ancient and contemporary Indian music. 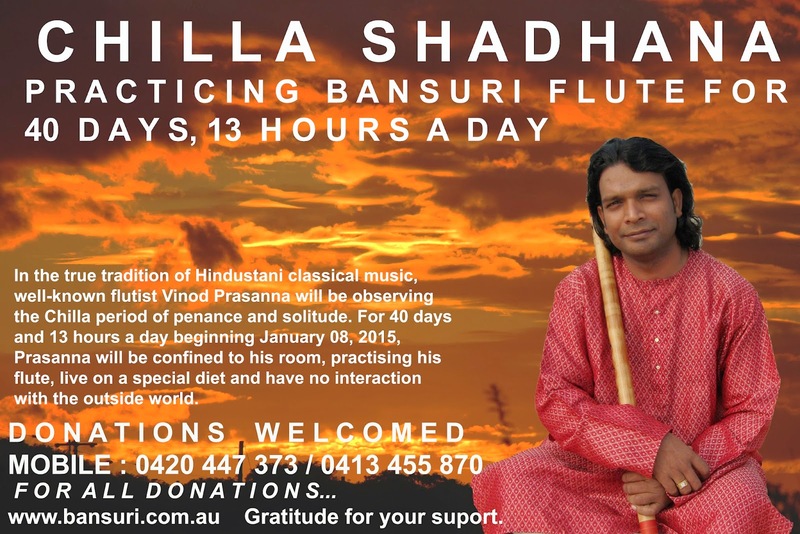 Renowned flutist Vinod Prasanna to undergo 40 days of penance In the true tradition of Hindustani classical music, well-known flutist Vinod Prasanna will be observing the Chilla period of penance and solitude. For 40 days and 13 hours a day beginning January 08, 2015, Prasanna will be confined to his room, practising his flute, live on a special diet and have no interaction with the outside world. “The chilla is performed for spiritual as well as worldly attainments, psychic abilities or complete enlightenment depending on the desire of the practitioner who performs it,” according to experts. For Prasanna, undergoing the Chilla has a special meaning. Besides aiming to achieving high skill in his art, he will also be raising funds to further the cause of his music. Those who wish can go to www.bansuri.com.au and donate. “It will not be an easy task but I am committed and preparing myself for this,” says Prasanna. Prasanna’s journey as a flutist began since the age of 18 performing at the famous temple of Goddess Seetla, in the Hindu Indian town of Varanasi after training for years as a child under the tutelage of his renowned Shahenai player grandfather Pandit Vishnu Prasanna. He belongs to the famous Banaras gharana family which has performed for more than two-and-a-half centuries. Over the years, he has given many international performances in France, Germany and Japan, to name a few, and received many awards along the way. In Australia, Prasanna has performed at the Global Harmony festival in Coffs Harbour, where his music was received well. Together with brilliant Australian tabla player Glen Kniebeiss, he stunned audiences at the Bellingen Global Carnival in 2008. In 2009, he also performed at the Music for Meditation at the Federation Square and at the Fairfield Amphitheatre Summer Concert Series. He was also part of the inaugural celebrations for the 2009 opening of the Parliament of the World’s Religions, performed at the Premier’s 2009 Sustainability Awards and at The Melbourne Arts Centre for the Multicultural Arts Council, Victoria. In 2009, Vinod’s music was also featured on the soundtrack to Australian film The Taj. In 2010, Vinod's music was enjoyed by thousands at the Woodford Folk Festival where he teamed up with Glen Kniebeiss again. In 2012, when internationally acclaimed musician and humanitarian Ani Choying Drolma from Nepal came for her first ever Australian tour, Prasanna was roped in to play for her. “Ani’s music is very sensitive,” he says. It has been said that Prasanna’s sublime flute song takes the listener on deeply moving journeys, both musical and spiritual. Wherever he plays, he captures the hearts of his audiences. Prasanna’s music pays homage to both ancient and contemporary Indian music.